New York City at the turn of the century was a time of transformation. From a sleepy collection of boroughs along the Hudson to a bustling, frenetic city of millions, New York was a city on the verge of tremendous changes. Not surprisingly, many of them were created to meet the needs of the thronged streets and avenues. By the end of the 19th century, society both fashionable and wealthy, as well as the entertainment world, moved up the island. Broadway was lined with electric streetlights and packed around the clock with theatergoers, club patrons, chorus girls and tourists. But the glamorous limelight was at this time focused on 42nd Street and points south, in the district then known as the Upper Rialto. This scene marked the birth of Times Square. Originally called Longacre Square after a similar London district, this intersection of 42nd Street, Bloomingdale Road and Seventh Avenue was made of the nexus of important roads to the north of the island. 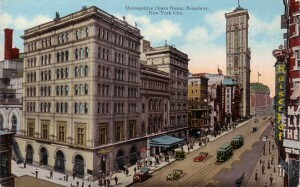 With the shift north, New York Times publisher Adolph S. Ochs moved his operations to the newly-built Times Tower. Marooned on a tiny triangle of land at the intersection of 7th Avenue, Broadway and 42nd Street, it was at the time Manhattan’s second-tallest building. 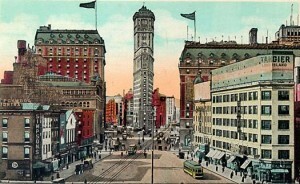 Having persuaded the mayor to build a subway station there, the area was also renamed “Times Square” on April 8, 1904. Three weeks later, the first electrified advertisement appeared on the side of a bank at the corner of 46th Street and Broadway. To inaugurate the move, Ochs hosted a massive celebration in the square for New Year’s Eve. Over 200,000 people attended the all-day street festival, which culminated in a fireworks display set off from the base of the tower, and at midnight the joyful sound of cheering, rattles and noisemakers from the attendees could be heard, it was said, from as far away as Croton-on-Hudson, thirty miles north along the Hudson River. 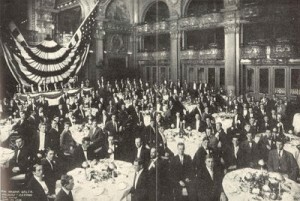 While there was no ball, the popularity of the party paved the way for the first dropping of a time ball in Times Square to ring in the New Year on December 31, 1907. 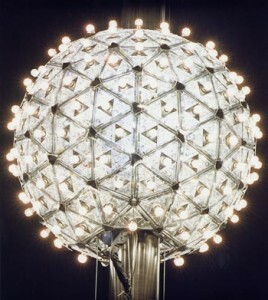 The first New Year’s Eve Ball was built by a young immigrant metalworker named Jacob Starr, and for most of the twentieth century the company he founded, sign maker Artkraft Strauss, was responsible for lowering the ball. Constructed with iron and wood materials with 100 25-watt bulbs weighing 700 pounds (318 kg) and measuring 5 feet (1.5 m) in diameter, it was affixed to the flagpole at 1 Times Square to drop 1 second after midnight. To ring in 1908, waiters in lobster palaces and fine restaurants in the hotels surrounding Times Square were supplied with battery-operated top hats emblazoned with the numbers “1908” fashioned of tiny light bulbs. At the stroke of midnight, they all “flipped their lids” and the year on their foreheads lit up – conjunction with the numbers “1908” on the parapet of the Times Tower lighting up to signal the arrival of the new year. A testament to New York’s rapid change, Times Square went from simple area known for its horses and carriages to the dazzling, billboard advertisement square you see today in a period of less than ten years. Despite its complete transformation, there remains one constant link with the past: the New Year’s Eve celebration. I enjoyed reading this so much – I always learn something when I come by, and you know how much I love NYC history! Thank for you for the wonderful valentine to Times Square. I’ve lived in New York my entire life and have come to appreciate the Square whenever I see old movies. Now it has become so Disneyfied at least to those of us who lived through the years when it was a little seedy. But you have just reminded me that it actually is probably now more what it was like at the turn of the century with restaurants and theaters galore. Of course, Red Lobster and Ruby Tuesday can’t compare to Rector’s or Sherry’s! What a wonderful post to one of my favorite areas in New York. I’ve read many interesting histories about Times Square, including Devil’s Playground, but you captured the spirit in your post. As a native New Yorker, Times Square has great meaning, although I sort of miss the seediness of the old 42nd street, compared to the current Disney version. Although the more things change, the more they stay the same. Just switch out Red Lobster for Rector’s. Since my WIP is set in turn of the century New York, I’m learning so much about the city. Can you believe that I’ve never visited, despite spending a great portion of my life on the East Coast? I hope to make a trip sometime soon. I know I’ll need at least two weeks to take it all in (if not Long Island’s Gold Coast, Newport, the Berkshires and Adirondacks). If you do, you have to check out the library at the Historical Society. Its saved me money in terms of doing research, although I still end up buying books! So much of Edwardian New York has disappeared unfortunately, but there are still a few standing mansions that have been converted into museums like the Frick, the Morgan, and the Cooper-Hewitt. My YA is set in turn of the century New York as well. Just discovered your blog and am thrilled! Next to the Regency period, the Edwardian is my favorite. I will be visiting regularly! What a wonderful post! I love anything and everything that relates to the architecture and lay out of old New York! I needed some information about New York at the turn of the century for my wip and on impulse thought I would pop over here an see what’s going on. Voila, today there’s a post on Times Square – how serendipitous Evangeline – thanks so much I knew I could count on you. PS – exactly when did the name change from Longacre Square to Times Square? I live to serve, Anita. *g* Thanks for the compliment–I work hard to make sure my content is as interesting and relevant as possible. According to an article in the New York Times’ archives, NY aldermen voted to re-name Longacre Square “Times Square” April 6, 1904. You certainly deserve a round of applause for your post and more specifically, your blog in general. Very high quality material. Thank You For This Post, was added to my bookmarks.